One of the things we are looking forward to on our journey to a happier life is being creative in the new kitchen. Using our home grown produce and local foraging to cook, bake and preserve etc, perhaps eventually even selling some ‘farm kitchen business’ style as so many smallholders do. We both like cooking, but Emma is the star. I like to plan, select meals, assemble the ingredients, and follow a recipe. For Emma every meal is like an episode of Ready Steady Cook as she creates amazing things and flavours instinctively from scratch with whatever is to hand. But all this could prove both a blessing and a curse for any future smallholding business. 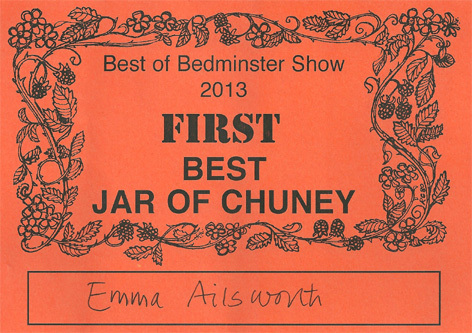 For example, Emma’s chutney won first prize in the 2013 Best of Bedminster Show, but can she recreate this award winning chutney for sale? No, it was a spontaneous creation of the moment using the random supplies to hand! 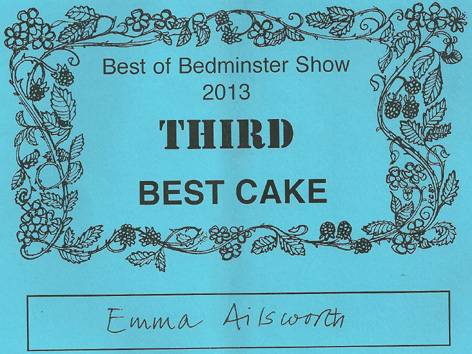 Emma was also awarded third in Best Cake, but that’s another story. Like my adventures in cider making, we are both going to have to learn to start writing things down if we are ever to develop a successful farm kitchen business. This entry was posted in Kitchen and tagged award winning, Best of Bedminster, chutney, cider, Emma Alesworth, farm kitchen, Paul Rainger, Ready Steady Cook, Smallholding by paulrainger. Bookmark the permalink.